Thanks Tom Joyner Morning Show for the inspiration. During the Memorial Day Holiday Tom & the crew were on vacation the temporary hosts were talking about, well I’m not sure what they were talking about I have a short commute to work. 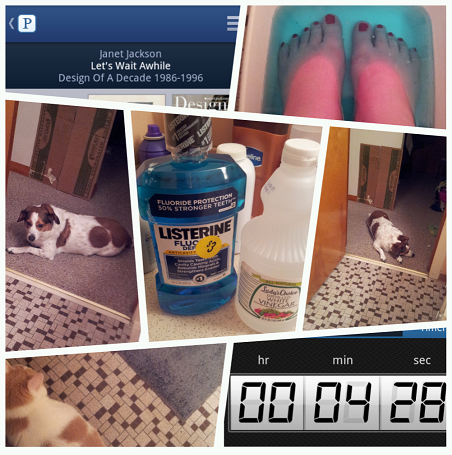 I did, however, catch the part about a home remedy – Listerine & vinegar for a foot bath to help with dead skin. Oh, now I remember – ashy feet! LOL, that’s what they were talking about. So, I said to myself, “self”, self said, “hmm? !” – “you should try that”! I have no idea why my feet look so red…I’m not a Martian. But I figured I’d give it a go all the same. The claims are that dead skin just “wipes off” and while that’s not necessarily true, more on that in a moment. I’ve gathered my ingredients, now time to relax and soak…That task was easier said than done, that’s for sure. As you’ll see in my photo grid my furry children weren’t sure what to think, I attempted to play Pandora and had a countdown going all the same. It wasn’t very relaxing. I didn’t measure anything, because let’s be honest, I don’t measure when cooking so I surely won’t when I’m soaking my feet. So, a good portion of Listerine, not so much of the vinegar (already discussed I don’t like the smell) and hot water in a tub and 20 minutes later I had blue feet and a somewhat numb leg. I sat in my bathroom, I didn’t see the need to drag the tub of hot water to the living room and back. I rubbed my heels together and nothing. Okay, fine enough it didn’t rub away… I decided to use my pumice stone…Aha!!! Like butter this “dead skin” began coming off. And then I didn’t mind the blue feet because I could see where I needed to scrub a bit more… While it wasn’t as “magical” as some of the blogs I found claimed it to be, it was certainly efficient. Any time you can soak your feet, be it Epsom salt or just some aroma therapy it can help dry, ashy feet. However, adding Listerine (and even that funky) vinegar can help you alleviate the dead skin rather easily with minimal effort with a pumice stone after the soak. I took it a step further and used my razor pedicure thingy (what’s the name for that anyway) to grab a few “pesky” spots that I gave up on scrubbing away. And just like that, some 30 minutes later I have fresh feet…Now, when I go see my favorite lady for a pedicure she won’t have to work so hard. Future Foot Baths: I may add a little more vinegar/Listerine and not dilute as much with water.